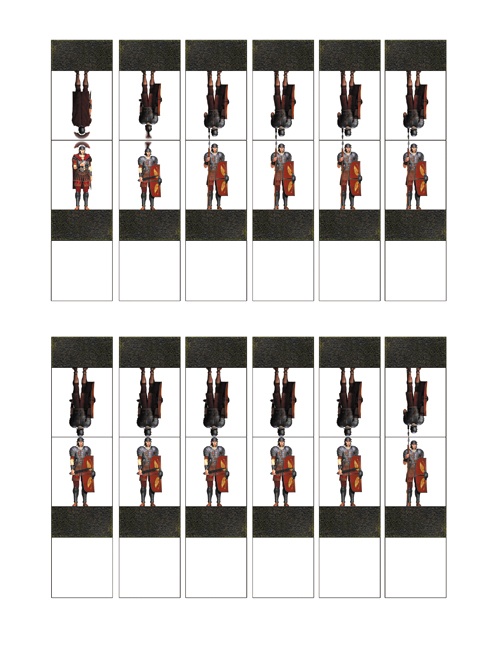 Roman Figure Flats has a single page of twelve Figure Flats as well as four top-down, base-less VTT token images. The four images are a Roman officer (such as a Legate or Prefect) with a flowing red cape, a veteran sergeant (Centurion) with a feathered imperial helmet, and ten regular soldiers (Milites), five equipped with gladius short swords and five armed with pilum spears. Printing the figure flat page over and over will result in a large Roman army, perfect for use with our Roman Fort map. Roman Figure Flats is intended for use in fantasy or Roman Republic/Empire period historical settings. The rank of centurion in the Roman Army could be equivalent to any modern rank between sergeant-major and colonel according to experience and assignment. The most junior century commander was a centurion as was the most experienced commander of the first cohort.